Turner President David Levy with NBA Commissioner Adam Silver on Tuesday morning. Photo by Jason Schott. Turner unveiled their new premium live sports streaming service, Bleacher Report Live, at their headquarters on Tuesday morning. In what they see as the future of how people consume sports, B/R Live will serve as the central hub for both the discovery and consumption of live sport content. The streaming service will allow fans to find and watch their favorite sports content anywhere, anytime, and on the screen of their choice. 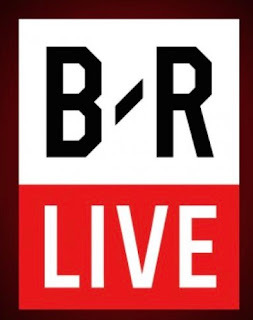 B/R Live will debut in April, and beginning this summer, will implement flexible pricing options, providing direct access to live games for purchase on an individual or subscription service. The main attraction for B/R Live is the UEFA Champions League and UEFA Europa Live. When Turner Sports was able to beat out FOX Sports, who has run the Champions League since 2009, for the new contract starting with the 2018-19 season, they knew they had secured a major draw for B/R Live. "It definitely was the hook for this," Lenny Daniels, President of Turner Sports, said. "Critical for a couple of reasons. It's all about awareness, the product, getting to know it, but for Bleacher Report, it's probably even more important. Where it came up from is we would look at Bleacher Report for the last 10 years, for example, and they know who's watching what and what leagues are working and what aren't, especially with the millennials that they reach, and you saw soccer go from number 10 to literally number three or number two now in this country, so we knew we can't ignore it, it's stupid to ignore it, but we also know that we're not going to just go out and buy a ridiculous package for a traditional television network. "The deal with Champions League covers everything. It helps awareness with B/R Live, it helps Bleacher Report because that's what fans want, and it's a great product for TV and for TBS." The fact that soccer clips can be shared so widely around the globe helps Bleacher Report "100 percent," said Daniels. "And it works both ways. Soccer in the U.S. has obviously grown, but it's not where they want it. They were looking for the perfect vehicle to grow it, and Bleacher is the absolute best vehicle to grow it. From their point of view, it was really a lot about Bleacher Report plus the size of our television networks, and from our point of view, it was everything I just said, so it was a match made in heaven." The other big property that will be part of this service is the NBA League Pass, which will debut on here for the 2018-19 season. Instead of buying the entire season through your cable provider, the vision here is a bit different, as fans can purchase and watch live NBA games in progress at a reduced price. 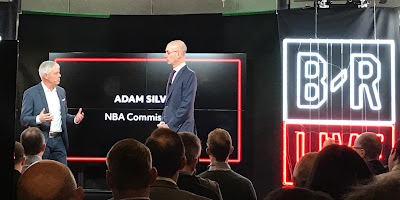 NBA Commissioner Adam Silver was on hand at Bleacher Report headquarters for the announcement, and said of what he sees the user experience for NBA fans through B/R Live, "You will of course be able to get full, live NBA games, and those are in essence $7. "We're still experimenting with pricing. but then I think the idea is to take a page from the virtual world of video games, where there's microtransactions, the thought was, it's not, you know, you mentioned the fourth quarter, it might not be the fourth quarter, it might be someone who, let's say, the game starts at 7:30 and they know they're free for 15 minutes and they're interested in watching a portion of a live NBA game, it may not feel like a fair consumer proposition that that fan needs to pay $7 when they know they only have time to watch five or 10 minutes of the game. "Again, under this notion of microtransactions, let's sell the fan what it is they want. They want five minutes of the game or they want 10 minutes of the game, so we're experimenting with pricing, but the notion is, let's say for 99 cents, you can get five minutes, you can buy another five minutes, and you then can come back to the game at a later point." NBA League Pass will also be available through the NBA App and NBA.com. In addition to Champions League and the NBA, B/R Live will offer thousands of live sporting events, which will include the PGA Championship, 65 NCAA Championships, National Lacrosse League, The Spring League (football), Red Bull Global Rallycross, and the World Arm Wrestling League. On how B/R Live will help grow sports like professional lacrosse and arm wrestling, "I think we're creating this virtual circle, which is what we really want to do. The secret, or the sauce, behind B/R live is we're building a recommendation engine that will actually learn what people are doing and what they like. It's no different than Netflix. They know if you like one movie, they put you right into another movie that they think you will like. "The same thing with us, we're going to know if you like lacrosse and watching lacrosse, you may like soccer, you may like arm wrestling, and we're going to put you right into that and that's a whole recommendation engine that we're going to learn about every individual." On how they were able to commoditize deals with these up-and-coming leagues, "We really are partners. We don't believe, not with every league, I mean everything's different, but with certain leagues, being a partner is far better than being a rights holder. If you come down to Turner and you see what we have at our facility, we have the ability to change and add components to a league that would be very hard for them to build on their own. "We have an entire social component, we have the whole digital operations center, we've got seven studios, a hundred editors, we've got everything they need, so when you look at this as a partnership, if they were to go out and actually built all that, it would have been prohibitive. So, now, we get it, we bring it together. We also have a sales team, and we're able to look at combining sales. We're able to really grow as a partner and not just pay rights fees and say, we'll see you in three years." B/R Live will provide three core services: find and watch live sports with the ability to scroll through a feed of real-time sporting events; personalization features which aggregate live sports content that is the best fit for each fan; and a modern approach to live sports discovery, giving fans the tools to locate and watch their favorite games. David Levy, President of Turner, said, "As viewing habits continue to evolve, Turner is well positioned to provide fans with direct access to premium live sports content that is highly coveted by audiences of scale, including a high concentration of millennials. When we first acquired Bleacher Report in 2012, we knew the definition of a network was changing as we anticipated a time when B/R would become a virtual network. Today is a significant step in that direction and we will fully leverage the reach of B/R and its deep connection with passionate sports fans to provide compelling experiences for them across this new, exciting platform." B/R Live will launch on iOS, Android, and the Web. It will initially launch with all streaming content available as part of a free preview period extending throughout the opening months of the product. The first event available through the service fill feature Johnny Manziel's debut in the Spring League on Saturday, April 7. Bleacher Report, in the six years that Turner has owned it, has grown into becoming the leading digital destination for millennial sports fans. Through its development and distribution of premium original content, such as Game of Zones and Gridiron Heights, and strategic investments including the acquisition of the House of Highlights platform, B/R has established itself as an influential brand that drives the connection between sports and culture. Dave Finocchio, CEO of Bleacher Report, said, "B/R has grown immensely in recent years, in no small part because of our total dedication to serving fans, and we have a proven track record of helping fans find the best digital sports content. Historically, we've pointed fans to the best content, whether on B/R or another destination, to deliver the greatest experience possible. We're excited to bring this same approach to the live sports space, helping millennial and Gen Z fans, especially, with a more streamlined experience as they watch their favorite teams and leagues."